series 10-Sword Pinstriping Brushes by Mack Brush Company. 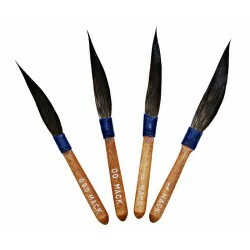 series 10-Sword Pinstriping Brushes are the favorite of Pinstripers and sign Painters across the world!. These brushes are for pinstriping, design and scroll work. Mack Brush Series 10 "Original Mack" Sword Striping Brush, made from the very finest grade of Blue Squirrel, wooden handle with blue ferrule. series 10-Sword Pinstriping Brushes have a single edge to pinstripe with, which is different than a pinstripers Dagger brushes which have two sides. Individual series 10-Sword Pinstriping Brushes Listed Below! Sword Style Pinstriping Brushes: Sword's longest hairs on top (tip) and tapers back to a shorter lenght on the underside by the handle. How Pinstriping Brushes are made: of three sections - the root, where the ferrule (the wire band or thread that keeps hairs attached to the brush) is located, the belly section in the middle, and the end tip. Most artists either blunt the normally pointed tip of the brush, or slightly alter the belly. Because a water-soluble sizing is used to keep brushes stiff during shipping, they need to be cleaned right out of the package. After the sizing is risned out, the brush is ready to be shaped. Selecting a brush is largely a matter of personal preference. What fits into a persons hand and they are comfortable with, which will vary for each person. It has been recommended that a shorter handle lengths for beginners so they have better control.